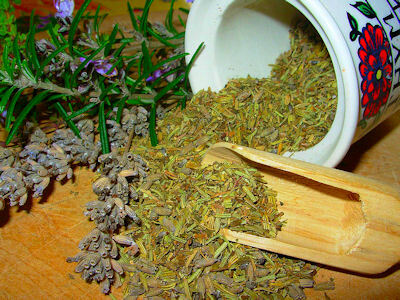 Herbs de Provence is a robust mixture of herbs made popular in the southeastern region of France. It is often used in the preparation of grilled meats, fish and vegetable stews, and is usually added before or during cooking. The ingredient ratios have altered over the years, and ingredients like tarragon, chervil and fennel have been added to some versions, but the basic recipe uses rosemary, savory, marjoram, and thyme (with the noted addition of lavender flowers). The individual herbs were staples to the French grandmothers of the region, although the blend that we now know as Herbes de Provence wasn't sold until the 1970's. The following recipe is as close to the original as I could find. Note that oregano can be substituted for the marjoram (they are cousins), but cut the requirement in half as oregano is stronger in flavor. This mixture can be made ahead and kept in an airtight container in a dark place. You are entirely welcome. Next time, check out some other herb blends. There are quite a few tucked away here. THANK YOU so much for posting this recipe as I have been looking for this for the last 6-8 months. Couldn't find it in the grocery stores and now I can make my own. Again THANK YOU!! Thank you for the blend. It was wonderful! thanks for posting the recipe.. But I have a question, what if I can't find savory in my local grocery store.. can I replace it with another herb? You might want to try substituting one more tablespoon of thyme, one tablespoon of mint and about a teaspoon of sage for the savory requirement in the recipe. Does anyone have a recipe for Lavender Pepper? I know it has lavender, garlic, black pepper, and sel de gris (french gray sea salt)....just not sure of the specific measurments to make the spice mix! Please Help! It's supposed to be a delicious blend with fish. Where do you get lavender flowers? You can buy them online from retailers like Amazon. They may also be available through specialty gourmet markets in your area. Just be sure to buy food grade lavender (grown without pesticides). I would add 1-1/2 to 2 tablespoons of chervil to the recipe above. I'd probably add the smaller amount first and adjust it to taste. Interesting how these things develop. Lavender surrounds the houses of any any Provence native, but we were never tempted to put it in Herbes de Provence. Love this pg...are you on Facebook at all??? I looked and can't seem to find you. I never really got into Facebook, but I am on Twitter and Pinterest. So, you probably hear this all the time, but I really love this blog. I am just planning on getting into my first garden with my fiance this Spring and will be using your site for tips! Thank you! I'm using this to make bread today. Didn't know what the ratio of the lavender should be, so thanks! This is truly a wonderful site - thank you for sharing! Is my own garden grown, pesticide-free lavender considered "culinary grade" for various uses? As far as safety goes, yes. Culinary lavenders are typically those that have the best fragrance. They include classic English lavender and the Hidcote variety. Perfume Lavenders is STRONGER but lack any of the complex aroma of culinary lavender varieties. Basil is one of my other favorite aromas. It has probably the most gentle anise aromas of any herb. Funny. To the person who finds the addition of lavender to be a mistake, the lavender makes it for me. It adds a mysterious little flash of unexpected flavour that enhances a huge range of other flavours. Very fragrant, sneaky and poetic. Good to know herbs are great frozen just washed ,dried then frozen. The exception is basil unless using in cooking. I have been using a Herbs de Provence that contained Statuette, Thym, Origin, and Domain made by La Gardette in Montreux 84170, 100g in a small burlap sack. Most probably brought back from France when my Parents visited in the 70s.